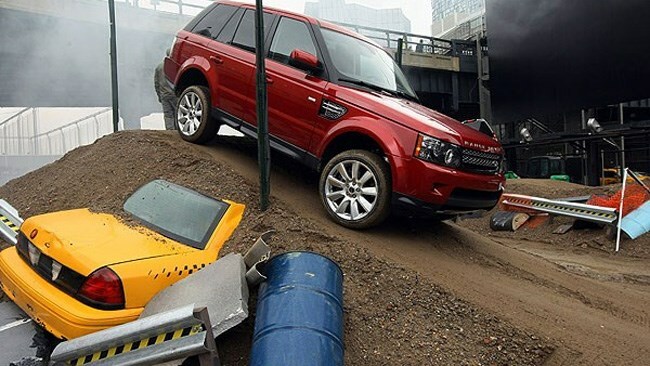 Land Rover has taken over a parking lot in New York and installed an inner city off-road course — which has already generated queues of an hour from people eager to try it out. The pop-up off-road course has been set up to mark 25 years of Land Rover in the US. Ordinarily a pay parking lot, the challenging course is located in the Chelsea neighborhood, in the former meatpacking district of New York — a favourite location of expat Brits living in the city. The course has been designed by Land Rover Experience experts and is a genuine off-road challenge. Ingeniously, it even includes a New York taxi buried beneath one of the inclines! Going live over the weekend, Land Rover reports interest has been huge. There have been more than 1,000 drives over four days, reports a spokeswoman, by invited customers, VIPs and other Land Rover executives. Models available to drive include an original 1987 Range Rover, a 1993 Land Rover 110, a 1995 Range Rover Classic, a 1995 Camel Trophy Discovery and a 1997 Defender soft top. Brand-new models from the Land Rover and Range Rover line-up are also available. The 1987 Range Rover was a tricky find for the brand: execs wanted a white classic model, to match that of the famous launch ad for the Range Rover in the US. The firm eventually found one — fittingly, located in Birmingham, Alabama. Land Rover North America even reunited the car’s original owner with the classic model. Land Rover has grown rapidly in the US since its launch 25 years ago, (the same year Platoon, starring Charlie Sheen, was released). At the time of its launch, the Range Rover was the most expensive premium off-roader on sale in the US — and today, more than 575,000 Land Rovers and Range Rovers have been sold in America. The US is now the world’s largest market for Range Rover, and New York City is the largest metropolitan market for the brand.